The place to buy Solve the World stuffs! Dante answers 17 questions regarding the finality of Jennifer Dash's story. Dante answers 14 fan questions Post-Glass House episode. 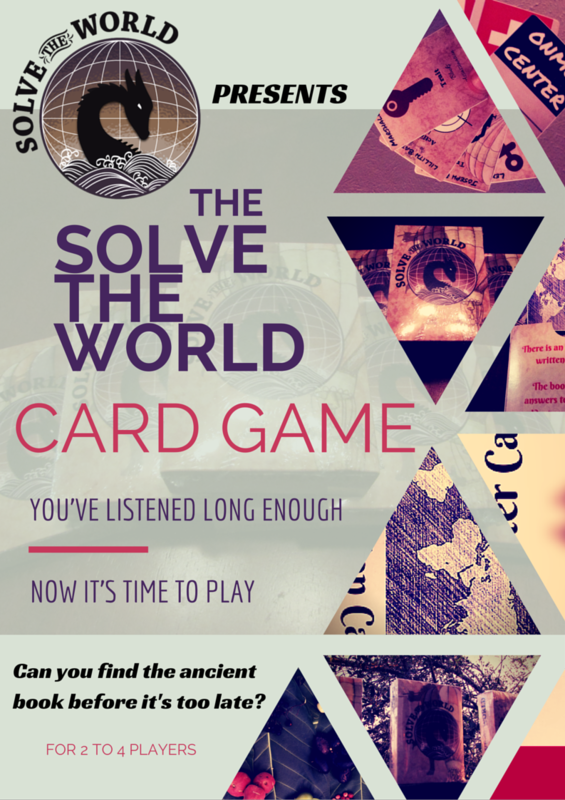 THE SOLVE THE WORLD CARD GAME IS SOLD OUT. FILL OUT THE FORM BELOW TO ADD YOUR NAME TO THE WAIT LIST. YOU WILL BE EMAILED WHEN/IF MORE COPIES OF THE GAME BECOME AVAILABLE. We'll notify you when the Card Game is back in stock. Be one of the first in the world to play! "There is an ancient book, written long ago. The book contains answers to the world's oldest questions. The smartest minds on Earth are searching for it. Will you find where it's hidden, or be assassinated trying?" Using 54 specialized cards, utilize Jennifer Dash, Miles Faa, and other characters from the Solve the World universe to find the Croatoan before your friends! Game play usually takes between 5 and 15 minutes. Get precious insight into the mind behind Jennifer Dash, Lillith Babbit, and the Pied Piper himself. Download this Behind-the-scenes Question & Answer style premium episode now. Dante addresses 22 fan questions about Part II of Solve the World. Fan questions to part one of Solve the World are answered. Dante Stack answers fan questions about the first 18 episodes of the epic serial podcast Solve the World.